That’s why the 91-year-old lawman still gets up every day and goes to work. 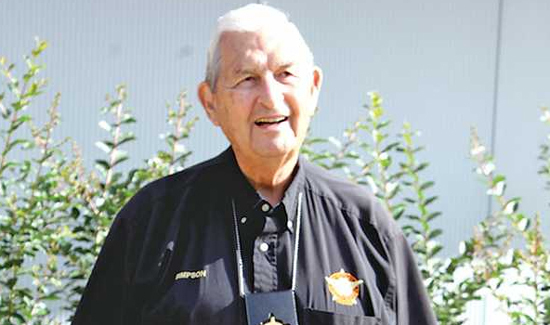 Simpson’s a Newton County, Georgia, sheriff’s deputy who just celebrated his 91st birthday. He’s also a veteran of World War II who was in the invasions of Anzio and Southern France, a legendary FBI investigator, as well as a husband, father, and grandfather. Last July 4 his son—a research scientist for the National Institute of Health—and grandchildren traveled from Washington, D.C. to join him for his 91st birthday. His co-workers also took a moment to celebrate him with an office party organized by NCSO Captain Keith Crum. Simpson’s been around so long, he was working murders before most of us were born. Simpson was with the FBI during the civil rights movement and was called over to Athens, Georgia, after Lemuel Penn was murdered. Penn was an educator from Washington D.C. who was traveling back to Fort Benning when he was ambushed by Ku Klux Klan members in Athens, Georgia. “They were standing in the street and saw three blacks with tags from Washington, D.C., and one of them said, ‘there goes one of president Johnson’s boys,'” Simpson said. “They thought they were outside agitators coming through town and they followed them out of town and one of them stuck a shotgun out the window, pulled the trigger and killed Lemuel Penn. Simpson was the one who got the confession. But surely the guy’s not working much longer, right?